Hi all! Everybody that reads our blogs knows that we are passionate about ODTUG. We already wrote about how it changed our lives, we have a lot of great friends there, we are frequent speakers at sessions/webinars and Kscope already became the “must to go” event of the year for us. 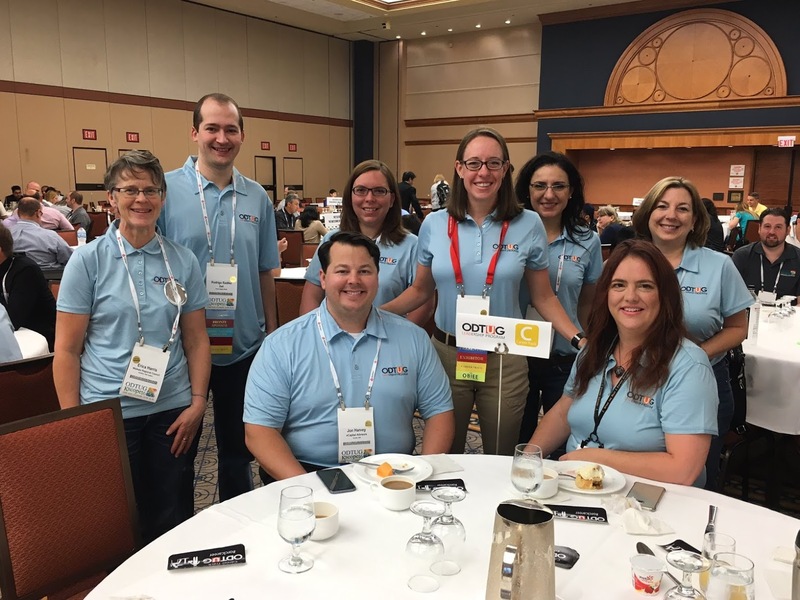 But since last year, it got even more special because I was selected to participate in the ODTUG Leadership Program, which I graduated during Kscope16. It was an AMAZING experience and since the “2017 ODTUG Leadership Class Application” is now open, I highly encourage all of you to also apply! Let me talk a little bit about my experience there. The leadership program is a nine-month program where the participants have the opportunity to join monthly webinars that talks about a range of leadership topics like leading a user group, being an effective mentor/mentee, work-life balance, to name a few. The participants also join a “project”, that is different for each leadership class. Our project’s class was about the creation of a new ODTUG community, aimed to attract young professionals to the Oracle career. The result of our project was the brand new community called “Career Track”, which I wrote a post about it here. But this description is just about the “technical” side of the program: you participate over nine months, have webinars to attend, one project to build. But this, in my opinion, is not the most important feature of this program. The most important one is the people that you will meet there. You will have contact with such an extraordinary/talented group of people that you will be extremely amazed and honored to be part of such a great team. The networking experience is one of the most powerful ones that I ever experienced. Over nine months I’ve meet great leaders in the Technology field, the entire ODTUG board, Oracle folks and some great new friend from around the globe (yes, the Leadership program is international!). Another great thing about the program is “exposure”. There are many opportunities within ODTUG to show you work, like webinars, meetups, technical papers and even Kscope sessions. The leadership program will put you in touch with the people that run those opportunities, so you will understand how they work and how you may participate on those as well. The program makes you feel like you “belong” to something greater than your normal jobs, so you get inspired to also to do greater things and exposure your work to other people. This is just a much resumed description of what I’ve lived during those nine months but I really hope that this may somehow encourage you to also apply for the next class. I totally guarantee that this is worth it and your live will never be the same again! I’m grateful for all those people that I meet during the program (all of you are amazing!!!) but I must write here a special THANK YOU to Sarah Zumbrum that was our class’ leader that guided us through the entire period. Few times in my life I’ve seen such a dedicated and passionate person about what she was doing. Her actions and words were always of a true leader and I’ll always take her teachings with me in both my personal and professional lives. Thank you again Sarah! … Kscope 16 has finished and it was amazing!!! Hi all, how are you all doing? Man, it was too fast…. This year’s Kscope was great, but when we realized, it was just over already. We got so much involved and busy there that our plans to do a “live blogging” just failed, so we will just go with a resumed version of it today (sorry about that!). This year for me was the “networking” year. We spoke with great new people, meet with old friends, recorded OTN interview, being in happy hours, parties, after parties, receptions, graduations and so on. It was a great social event for us this year. Luckily, we have the option to see all Kscope 16 recorded sessions afterwards (you too, if you have being at Kscope 16 or if you are an ODTUG full member) because there were some great sessions that I really wanted to attend, but there was no feasible time to do so. Our two sessions where just amazing! We got a very good number of attendees (thanks all that were there!) and the feedback during the event about them was just great! We are very happy that we could deliver some good information to all of you and this kind of feedback motivates us to keep going and bring more and more content for you all. This Kscope was also very special to me because I was graduating from the ODTUG’s leadership program. It was an amazing experience and later this week I’ll write a post talking about my experiences there and how do you apply for it if you are interested in doing so. It was a nine months program with some great people that I was blessed to meet face to face at Kscope 16. So, are you wondering where Kscope 17 will be? Check it out! Texas!!! I already had the opportunity to go to San Antonio and it is really a nice venue. It will be great to see once again the Alamo and walk down the River walk. A great thing about Kscope is that you get inspired by such a great content that you keep thinking about what are you going to present next. We are already taking notes on some ideas for next year, so you may be sure that we will do our best to also be present at Kscope 17. That’s it folks, thanks again for all of those that were present at our sessions! I’m honored to be part of such a great and well organized event! Hope to see you all again at Kscope 17!